I have a major weakness during summer. Snowcones and popsicles! Oh…and the ice cream truck. I swear, as soon as that creepy song and bell starts sounding on my street, my ears perk up and I want to order a Pink Panther ice cream bar or a dreamcicle or a Teenage Mutant Ninja Turtle bar with bubble gum eyes. Ya, I’ve been scoping them out. But I have had the willpower to not run directly into the street..only partially. Instead, I made up a batch of uber yummy adult popsicles. These strawberry mojito pops have a splash of rum, making them perfect for an evening snack or party. Or a solo party. Hot days and nights are begging for these puppies. And they are totally portable. Plus, why must kids have all the fun. But, if you are making these for youths, the booze can be left out….well, should be left out. So make two batches…one for those kids and one for you…all for you. These are dairy free, using coconut milk in place of milk, tangy from fresh squeezed lime and mint, and sweetened with strawberries and a dabble of maple syrup. If you love your dairy, you could easily use greek yogurt instead which will add more protein. 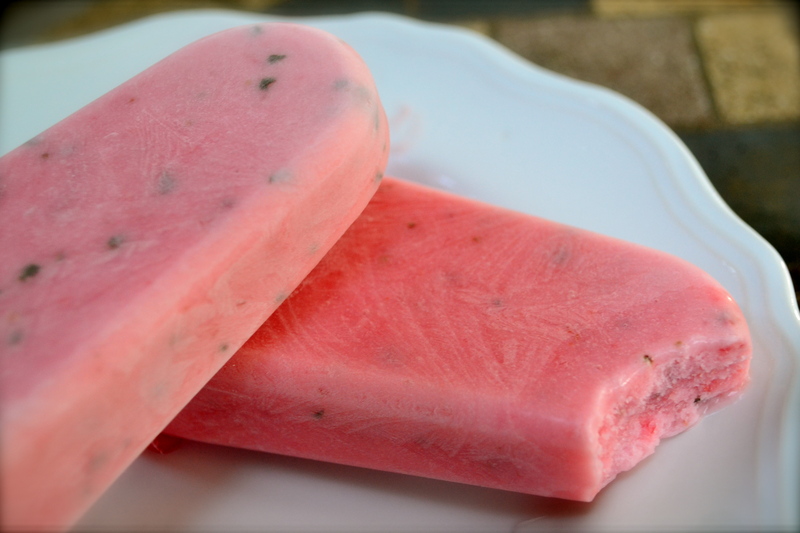 These popsicles were made with fresh picked strawberries that were nearing their last days, but frozen strawberries also would work. Popsicle molds can be found at most stores or online. You can also use paper cups. 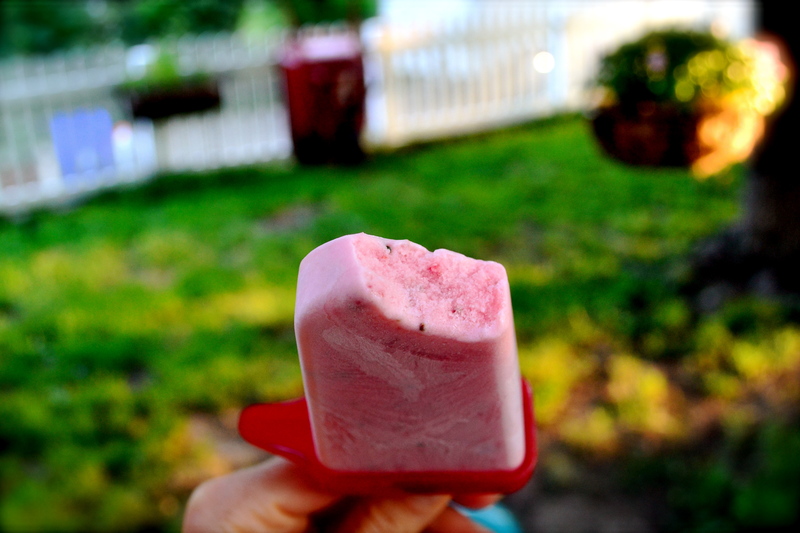 After allowing the pop to freeze and set for about an hour, slide a wooden popsicle stick into the pop. After at least 4 hours, these will be ready to devour! So quit buying pop ice! Why are you even toying with that day glow frozen slush. Jump on these easy pops. Sit back, enjoy your booze, stop sweating! Add all ingredients except rum to food processor. Process until smooth. Taste to ensure that it is sweet enough. I like mine more on the tart side. Add booze, pulse until combined. 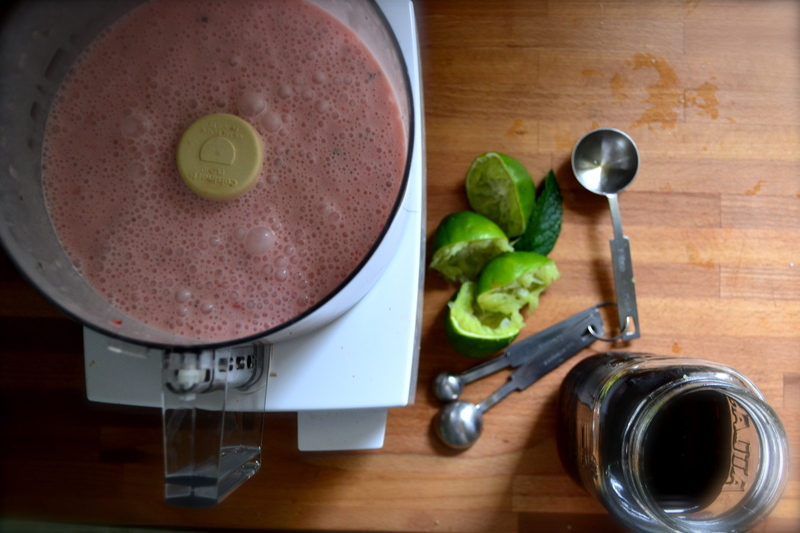 Taste…..add more booze. Whoa…not that much. Ok.
Pour into six popsicle molds. Allow to freeze for at least 4 hours. When removing from the mold, you may have to run hot water over the bottom of the mold so that they release. Will you drive the VW to Tulsa and be my ice cre truck?? I might make those tonight actually. We don’t have ice trucks in Montreal and owning one is actually a dream of mine! So funny- I literally just finished drafting a post with pops! How much fun is popsicle-making?? I’m really love it this summer. So happy that summer has just begun and I can play for months! If anyone asks what I’m doing this weekend, I’m going to send them this link! Haha! They are quite the treat! Enjoy!! !